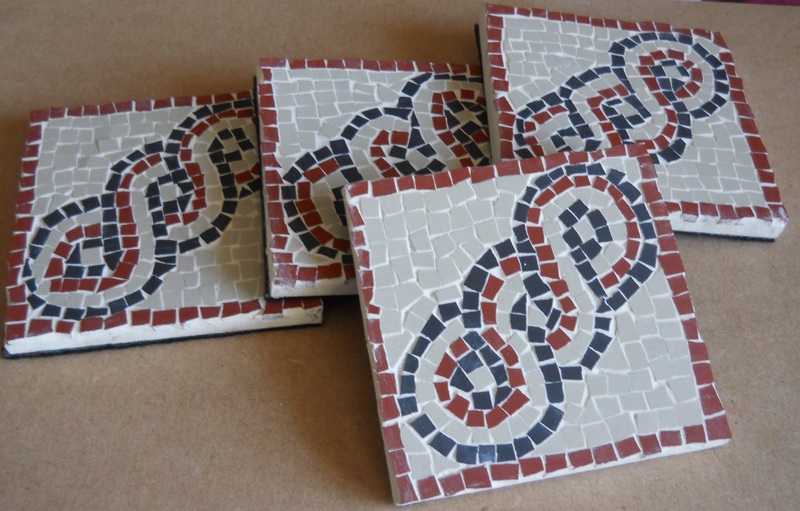 Mass production of coasters continues in my mini mosaic workshop therefore I present to you another coaster creation. These coasters have been made with one of my favourite designs, and possibly one of the most recognisably Roman designs, a guillouche section. These patterns can usually be found meandering their way around the edge of a Roman mosaic, weaving in and out of each other creating a seemingly complex pattern. Although it has been scaled down to just three sections in order to fit on the coaster it nevertheless still gives off the same effect, and in my view makes a rather classical set.